Exclusive modern 120 sq meters (1.291 ft.) apartment located on the second floor with elevator of an ancient building, located just right away the spanish steps and walking distance from all major attractions like trevi’s fountain, Navona square and the Pantheon. It is comprised of a large living room with sofas and a big dining table for 6 people, 3 double sleeping room, two with queen size bed and one with a comfortable sofa bed, two bathrooms with shower and a fully equipped kitchen. You will be surprised how quite is the apartment even if it is located in the middle of the historical centre of Rome. To make your stay super comfortable the apartment is provided with high quality flat TV and Hi-Fi Stereo, Wi-Fi internet connection, a washing machine, oven, microwave oven, Espresso machine, toaster and a docking station for iPhone and iPod. The excellent, modern furnishings with many design pieces from all over the world, high quality parquet floors and high ceilings complement this prestigious apartment in the heart of Rome. The apt is the home of an italian family. As you can see from the picture it is full of character. 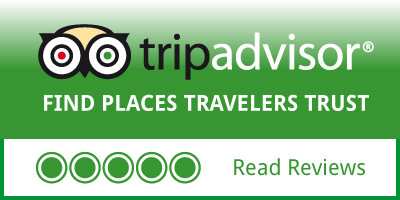 If you would like to experience Rome like a local this is the place for you. If you prefer the more sterile environment of a hotel room this is not for you. REST: 2 queen beds and 1 sofa bed. Baby cot (available on request). LIVING: table with 6 chairs and 1 large sofa bed. INTERNET : hi speed WiFi internet. HI FI for listening to music from a selection of cds or your own MP3 player. 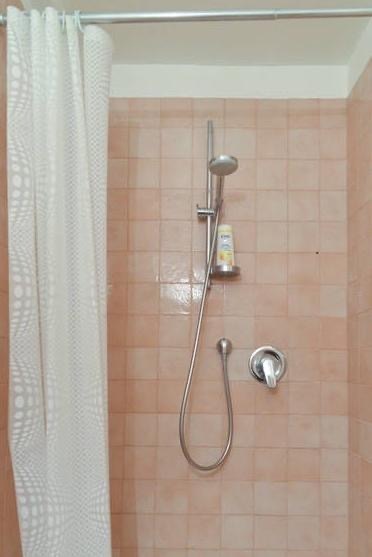 BATHROOM: 2 bathrooms with shower, hairdryer and fresh linens. KITCHEN: pots and pans, stove and oven, refrigerator, freezer, microwave, utensils, dishes, glasses, etc. YOUR CLOTHES: empty closet with hangers, dresser, washing machine, iron, and ironing board. 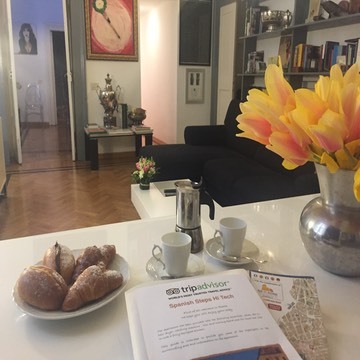 The apartment is located in the heart of the historical centre, just few steps to the Spanish steps and walking distance to many key sites including Trevi’s and Bernini fountains, Navona square, the Pantheon, Popolo square, the beautiful Villa Borghese park and Via Margutta world famous art galleries street. Even if all attractions are walking distance, Spanish steps metro station is right away. 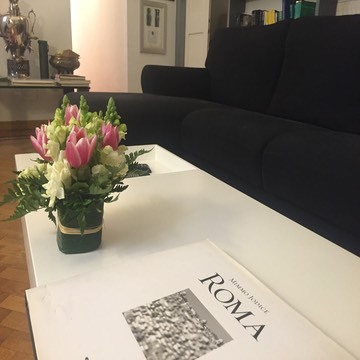 The location is well known from shopping lovers as one of the best addresses in Rome, just 1 minutes away by foot from the fashion district of Via Condotti, Via Frattina and Via del Corso. This area is a great place for a relaxing drink at the end of a long day in the evenings and it is surrounded by many open air fine restaurants and bars. SUPERMARKET: food market open 7 days a week, is around the corner. chinese. and many more around the apartment. BUSES: many bus stops one block away. Apartment is 2 floor up with elevator. From Termini Station take Metro Line A (direction Battistini) for 3 stops to “Spanish steps” stop. You are 300 meters from the apartment.